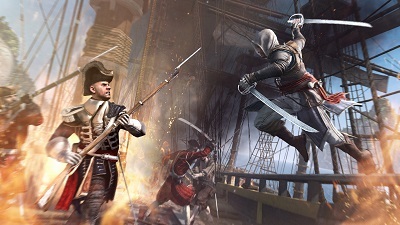 France-based global video game developer and publisher Ubisoft has announced that, for the time being, it has no plans to bring Assassin’s Creed 4: Black Flag DLC content – which is exclusive to Sony – to other platforms. Even though promotional material for the DLC states that there is a six-month exclusivity period for the PlayStation 3 and PlayStation 4, the studio has confirmed that it will not be releasing it to Xbox. A representative for Ubisoft said, “I can confirm that at the current stage the PS exclusive DLC isn’t planned for Xbox 360/Xbox One.” The game’s DLC content offers an additional hour to the main story campaign and revolves around Aveline, the character from Assassin’s Creed: Liberation. The latest announcement comes after reports last week stated that Assassin’s Creed 4: Black Flag DLC was a times exclusive on PlayStation 3 and PlayStation 4. Promotional material stated that the content in question was exclusive to Sony consoles for just six months. Ubisoft’s Assassin’s Creed IV: Black Flag was released on October 29, 2013 in the US and received positive reviews, as numerous publications stated it went back to a brilliant state. The game is scheduled to be released in the UK on Friday, November 1, 2013.